One of my favorite breakfast foods is strata! I love this recipe for it because it is lighter than most. Instead of using 7 whole eggs, you use 6 whole eggs and 2 egg whites. Amazing! Even though I have never found a bread pudding recipe that I have liked, I adore strata! The concept is similar: both soak bread in an egg froth and are baked like a casserole. Given my love of strata, I am always adapting to create variations! Now I still need to find a great bread pudding recipe so maybe that will be one of my projects for Christmas vacation! But it’s Thanksgiving vacation right now! In keeping with the current and upcoming holiday season, Thanksgiving holiday, I must highlight the movie Holiday Inn. Even though this heart-warming classic made in 1942 may seem old fashioned, I watch it at least a few times throughout the year. After all, that is what makes a classic! One of the songs from the movie is about Thanksgiving. Written by Irving Berlin and sung by Bing Crosby, here’s “I’ve Got Plenty to Be Thankful For.” If you’ve seen the movie, you know the scene is a bit tongue-and-cheek! 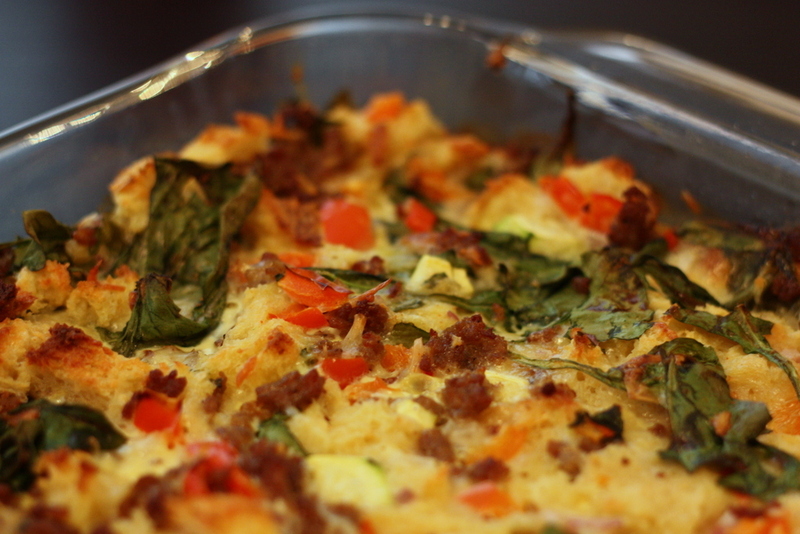 So enjoy light breakfast strata for tomorrow morning’s brunch! Spray 10”x15” baking dish with non-stick cooking spray. Loosely measure 4 cups fresh baby spinach. Spread in bottom of baking dish. Rip bread into small pieces and place over spinach. Dice zucchini, onion, and red pepper. 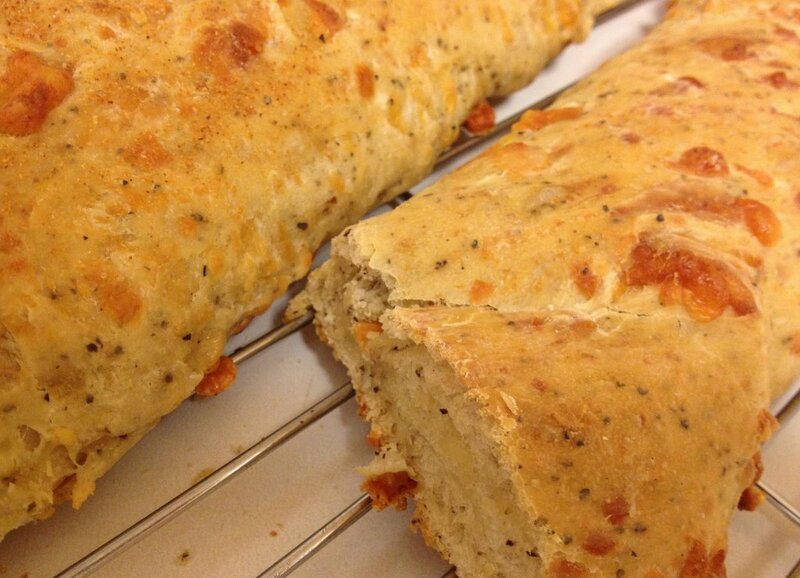 Scatter over bread pieces. Scatter hot pepper cheese, Parmesan cheese, and sausage over vegetables. In a 2-quart bowl put 6 whole eggs and 2 egg whites. Whisk together. Pour skim milk and half-and-half cream into bowl. Add nutmeg and cayenne pepper. Pour over all ingredients in baking dish. With your hands, squeeze liquid into bread, evening out ingredients and tucking spinach underneath. Bake for 30 to 35 minutes. Check for doneness. Center should be set.